BENGAL TIGER: What Are Bengal Tigers Like? What Are Bengal Tigers Like? The Bengal tiger, also known as the Royal Bengal tiger, is the most numerous of six tiger subspecies still living on Earth. These beautiful big cats are endangered, however, with fewer than 2,000 animals remaining in the wild. 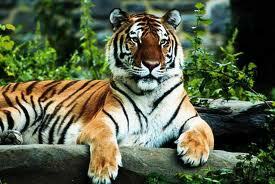 Bengal tigers grow to 13 feet (4 meters) long, and males weigh between 400 and 675 pounds (181-376 kilograms). Female tigers are generally smaller. A Bengal tiger’s coat is a yellow to light orange, with stripes that range from dark brown to black. The tiger’s belly is white, and its tail is white with black rings. A rare mutation of the Bengal subspecies, the white tiger, has dark brown or reddish brown stripes on a white background.